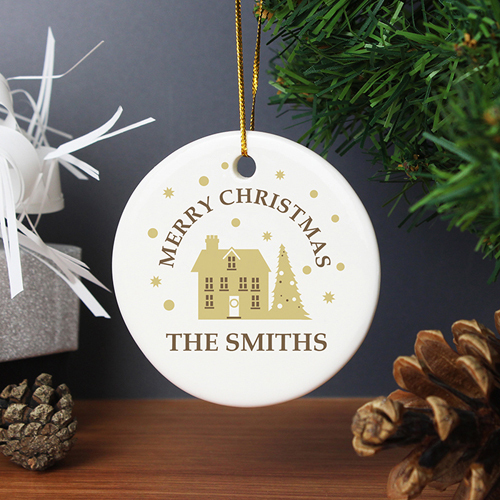 This decoration will look the part on any Christmas tree. Personalise this Festive Village Decoration with 2 lines of a message. Line 1 will appear in UPPERCASE and can have up to 15 characters. Line 2 will appear as entered and can have up to 20 characters. Decorations come supplied with thread ready to hang straight on the tree. Colour of ribbon/thread may vary. Personalise with 2 lines of a message. Line 1 will appear in UPPERCASE and can have up to 15 characters. Line 2 will appear as entered and can have up to 20 characters.